Friends and Followers! During the Linköping Whisky Expo I was very lucky to retrieve a sample of the coming release from the Swedish west coast distillery Smögen! The festival was in february and I have had the sample for quite some time (trying to balance between resisting to taste it and to publish my review in time for the release), so as you can all understand I am today very eager to taste the whisky! 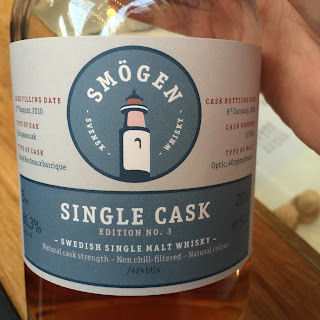 As you know by now, at Smögen they only produce peated whisky, and in this release they have used 40ppm malt. Being casked 100827 and bottled 160106, the whisky is 5 years (and 4 months) old. It has spent it's entire life in Single Bordeaux Cask 3/2010 (european oak 225 litres). 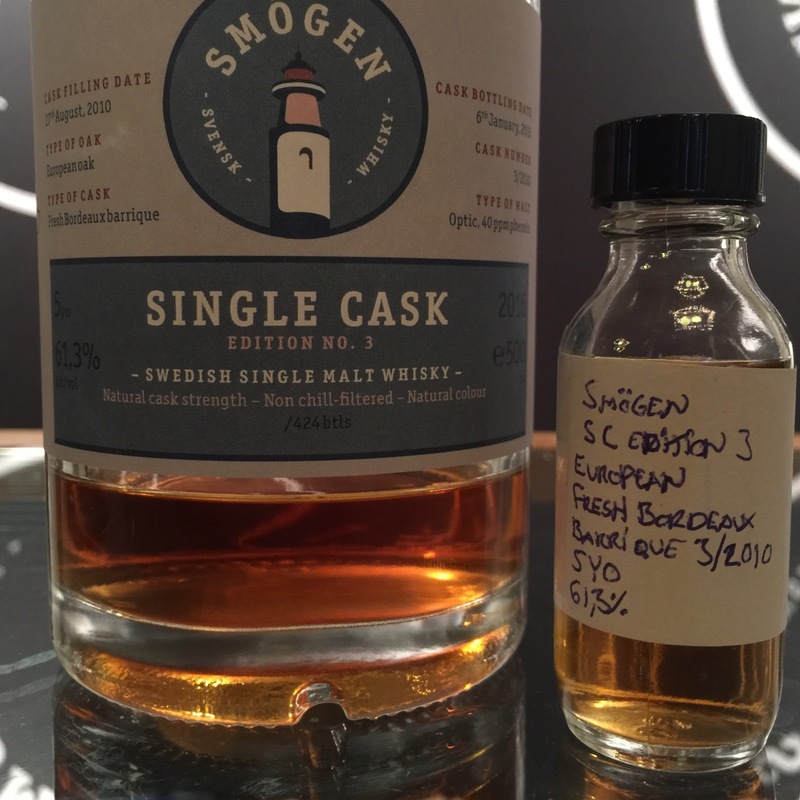 At 61,3% ABV (natural cask strength), the cask gave 424 bottles out of which 300 bottles has been sent to the swedish state monopoly. The 300 bottles are ready to go on sale this thursday at 10 o'clock as a web-release. International buyers can find the products of Smögen Distillery here. "Usually barriques are used for 2-3 fillings, roughly 1-1,5 years per filling (a little bit longer for Sauternes-wine), so if I guess, around three years in total. There are no clues regarding this written on the cask ends besides an incomprehensible number/code"
So my friends, the cask has had Bordeaux-wine in it for quite some time indeed, this should be a treat! But before I try let me just send out big thanks to Pär for the opportunity! Ok, let's see what we have here! When opening the bottle and pouring some of the whisky in my glass I initially pick up very, very slight touches of baking yeast. Besides the somewhat expected sherry-esque/wine-ish stuff like sultana raisins, dark raisins and liquid dark honey, I also pick up under-ripe pear (sliced), but most of all very generous whiffs of fullfat whipped cream, vanilla dryness and something like redwine liquorice. The vanilla in this whisky is quite special indeed, not really fudge-y but rather something like vanilla powder (the kind one uses when baking), so a very dry vanilla or austere if you know what I mean… when nosing I can almost feel how the vanilla dryness would feel in my mouth sort of. For me there is also very obvious stuff reminding me of chocolate/cocoa powder infused with vanilla, so all in all a quite bake-ish/dessert-ish style. I must say that there is actually a focus on vanilla rather than the sherry-esque/wine-ish stuff you might expect from a whisky that’s matured in this kind of cask. Now, I haven’t even written anything about the peat, I guess I didn’t event hink of it because it’s so extremely well integrated into the whole nose. 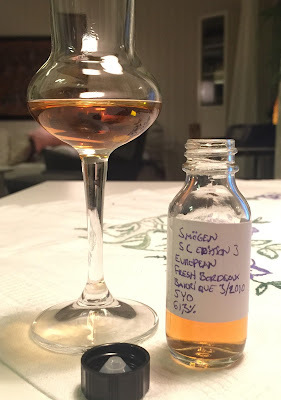 If I would even try to compare this whisky with anything (nose-wise) I can only draw my mind to something like a heavily sherry matured and medium peated, Springbank of say the age 12-15yo, veeery good stuff! Ok, let’s have a sip! You might remember me raving on about how freakishly great the previous SC release from Smögen was (the Sauternes one), folks, this is if possible even better and I simply can’t believe this is only 5yo! Given the fact that this whisky has been matured in a full-size 225 litre barrel it’s f-ing amazing that it has reached this very mature state already, so don’t miss out when it’s launched, if I had the possibility I would definitely buy a whole case of this whisky! Sláinte!